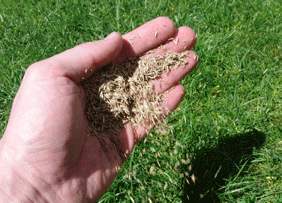 The routine every homeowner should have is adding grass seed to your existing lawn and by over-seeding your lawn once every few years, you are going to create a thick, beautiful lawn that’s resistant to weeds. What’s interesting about grass is once it gets to be about five years old, it drastically reduces the amount of new grass that produces. So by adding grass seed once every few years, you are going to maintain a healthy lawn. So the first step is you want to mow it and you want to set your mower to the lowest setting.The rest of the year, you want the highest setting, but for this we’re going to put it on the lowest setting, we’re going to mow the lawn and if you have a bag catcher, use it, because we need these seeds to touch soil. If the seeds don’t touch soil, they won’t germinate. So once you mow your lawn, then you want to water your lawn thoroughly and it’s going to help with the germination. And then you want to put down your grass seed. And you want to get a good quality perennial grass seed and you are going to put it down with a spreader or a hand held spreader. After you get the grass seed down, you want to apply a starter fertilizer or you want to put down a seeding soil. And you can put seeding soil into a spreader and just tap your whole lawn, which is healthy for your whole lawn. 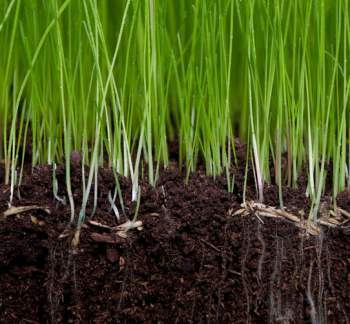 And what is nice about the starter fertilizer is once the seeds use up the nutrients inside the seed and the roots are starting to go into the soil, it’s going to give them those nutrients so that they develop good root quality. The next step and the most important step is you need to water your lawn twice a day for two weeks. And you need to be diligent, because if the seeds dry out or if the seedlings dry out, they will die. And one tip I’ve got from the lawn care on YouTube is he suggested every time you over-seed once every few years, it’s a great time to aerate your lawn too. So if you follow those steps, you’ll have a beautiful healthy lawn that’s going to be resistant to weeds.